Blogged yesterday about new brain cells being created. That post was sparked trying to understand a paper that has was published in June this year. The paper investigated and found out that lack of zinc reduces brain cell creation in the Dentate gyrus. As I discussed yesterday the lack of brain cell creation can be caused by depression and anti depressants increase the creation of brain cells. This as answered a question that I have had for four years! Early on in my search for wellness I discovered that I had massive zinc deficiency. 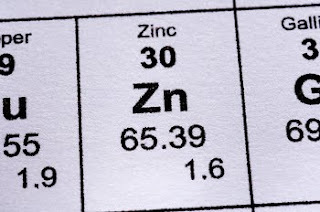 There is a simple and qualitative (that is approximate) test for zinc which is the taste test for zinc. Zinc sulfate in liquid form in help in the mouth and the level of disgusting taste is an indicator of zinc levels. When I took the test I could taste nothing, it was just like water. The tester was amazed that I was already taking 15mg a day in my multivitamin. She had never seen anyone register so low that was on a multivitamin. So I took an extra 30mg a day on top of my multivitamin. It made an immediate and substantial difference in my mental health. Nearly overnight I had a improvement of mood. However there was very little, if any, studies that linked depression and low zinc levels. Hence I have always wondered why this worked. As it turned out as my mental health improved, my need for zinc decreased. In opening the zinc tablet bottle if I could easily smell the metalic and slightly revolting smell it meant that I didn't need any that day. My need for extra zinc (that is above the 15mg that is in my double X) has passed. As an aside, the reason why males tend to be low in zinc is because they loose between 10-15 mg every time they ejaculate, and 15mg is men's RDI. They clearly set the RDI based upon studies were the men were not sowing their wild oats so to speak. The other interseting point is that suddenly food had much more flavor. It disapointed me how gross vege's now tasted, and didn't enjoy strongly tasting food such as blue vein cheese as much. Anyway back to the main point. The paper showed that low zinc levels, resulting in low brain cell creation. Low brain cell creation is linked to depression. This is why my depression improved with the extra zinc. Question answered.